yiannis krikis (thessaloniki, Greece) on 20 December 2008 in Lifestyle & Culture and Portfolio. Amazing urban image, illuminated in the night showing those ghostly mannequins. Yiannis, I love this photo!!! Such an amazing image from an ordinary urban view! Great, great, great! I love that the background is totally dark. And the lamppost just adds the cherry on the pie. A favourite shot! what an original view and framing - you got it ! Bluebeard's brides - macabre! Great shot. Another clever shot. The lighting was really well done. 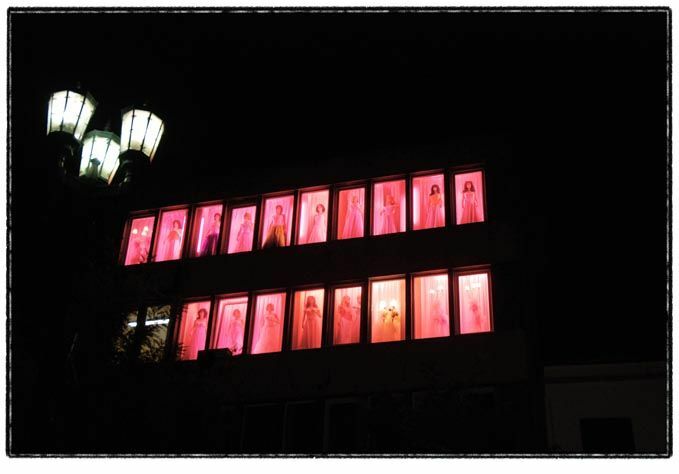 There's something odd and striking about the red light in the windows. Great find. What a unique image this is, Yiannis. A really remarkable composition. Perfect! love how the repeated pink rectangles balance the frame with the street light. it is ghostly. very well done! this is very cool! i know they are wedding dresses but the image has quite a voyeuristic feel to it.